One of my favorite things to do when I was a kid was catch the numerous frogs, toads, and snakes that roamed our 11 acre woods. I would store them in buckets and an old plastic swimming pool that we filled with sand and water. I considered myself quite the frog caretaker and I knew that what I was doing was giving them a better life. Although putting snakes and frogs in the same container may have been a misstep. One day I was watching a show on pbs. The show was discussing the life of the monarch butterfly and showed a man helping a butterfly migrate in cold weather by cupping it in his hands and gently breathing warm air on it to heat it up enough to fly. This action, I believed, saved that butterfly's life. I was in the woods exploring on a cool fall day when I found a frog that was alive, but stiff and sluggish in the cold. I remembered that little nugget of information about the butterfly and I knew that I could apply the same technique to this very frog. I would be the frog whisperer. So I cupped my hands oh so gently around this frog and as he lay still, surely in the throes of death, I took a deep breath and exhaled a sigh of warm life giving air around him. And that frog jumped straight into my mouth. 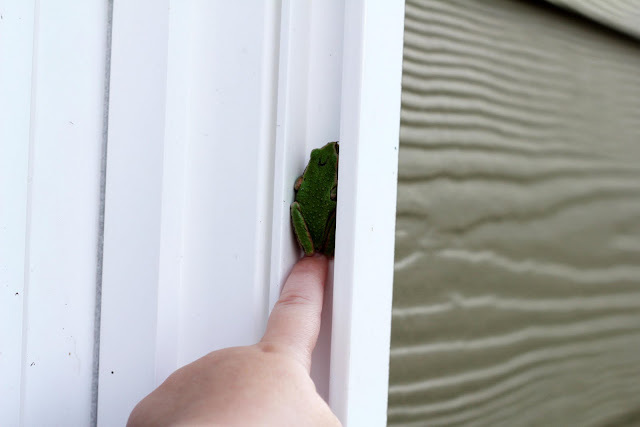 Several years and a lesson about amphibian hibernation later, I bred the second generation of frog torturer whisperer and have been training him in my backyard. He caught two yesterday without hurting either one. I knew with you that post had to get funny! I seriously laughed out loud. I don't like reptiles. Amphibians I can handle, but snakes are awful. Remember that one time when we were playing in the woods around your house and you saw a snake right by my foot? I never even saw it! I just started running! ha ha. Good times. Aww! Im not sure if Cardon would be interested or freaked by the site of a frog...probably a little of both. I love it! I have been thinking a lot lately (not sure why) about my childhood in Michigan, and particularly "going frogging." There were so many great places to catch frogs around MP! I would love to take my children there and experience it with them, although that's a really expensive trip to take just to catch some frogs, don't you think? You are a true student of biology. We loved your experiences.